LynxSecure 5.3 is a DoD certified secure virtualization solution based on separation kernel technology. 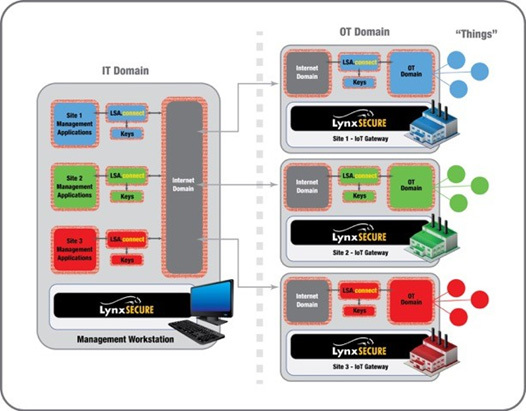 When deployed in an IoT gateway, LynxSecure implements the robust separation of domains, ensuring that the Operational Technology (OT) network hosting the IoT endpoints is securely isolated from the wider Information Technology (IT) network. With a tiny trusted code-base, LynxSecure provides IoT endpoints and gateways with the protection they need by reducing the attack surface exploitable by malicious agents to an absolute minimum, and securely controlling any communications between the OT and IT domains. LynxSecure 5.3 is the enabling platform for LSA.connect, a secure network encryption component built using LynxSecure bare metal applications (LSAs). In its simplest configuration, LSA.Connect can be used to encrypt network traffic without exposing a large attack surface to malicious agents by housing the network encryption algorithms in their own secure domain, away from both the operating system connected to the internet and the encryption keys themselves. In a more sophisticated configuration, LSA.connect can be used to extend the principle of domain separation to the network, by supporting multiple isolated encryption tunnels over a single physical network connection, again each housed in their own isolated domains (see Figure 1). Lynx is also partnering with Webroot® and combining its IoT Security Toolkit with LynxSecure to provide real-time threat intelligence services and intelligent cybersecurity device agents for the protection of critical IoT and IIoT systems against rootkits and other Advanced Persistent Threats (APT). By embedding components of the Webroot IoT Security Toolkit inside their own domain on LynxSecure, threats can be detected, identified and removed without the constraints or risks inherent in running solutions at the operating system level. David Dufour of Webroot will take the detection gap as his theme in a paper on Tuesday at 10.30 about “Securing IoT Devices Using Big Data and Contextual Analytics”. At 13.30 on Thursday, Robert Day and David Dufour will follow up with a paper on “Securing the IoT - Combining Platform Protection with Cloud-based Threat Intelligence“. LynxSecure 5.3 is already available on the Intel Architecture and will be released on ARM platforms in 2016.